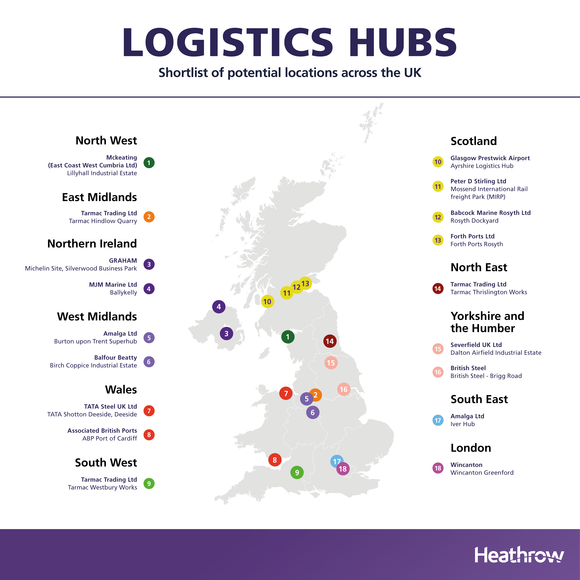 LONDON, UK, 2019-Mar-29 — /Travel PR News/ — Heathrow today (28 March, 2019) announces the names and locations of the 18 shortlisted sites that remain in the running to help deliver the expanded airport, signalling the project has reached a new and significant milestone on its path to delivery. The final four sites will become offsite construction centres that will help to deliver Britain’s new runway bringing jobs and economic opportunities to every corner of the country as Heathrow looks to construct as much of the expanded airport offsite as possible. This innovative approach will also help to make the project more affordable and sustainable – by transporting assembled components in consolidated loads. “Our expansion plans are progressing apace and continue to be refined thanks to feedback from a wide range of stakeholders. Heathrow is as committed as ever to creating a plan that delivers for every corner of the UK. Logistics hubs are key to achieving that. This innovative approach will be more cost effective, efficient and sustainable, helping to unlock much needed capacity quickly and responsibly. “A strong skills base and high-performing infrastructure network are vital to securing the UK’s economic future in the long-term. We are pleased that Heathrow is consulting with so many business communities from the Chamber of Commerce Network to ensure that its expansion plans can benefit the whole of the country. This entry was posted in Airports, Business, Travel, Travel Management, Travel Services, Travelers and tagged airport, Claire Walker, Emma Gilthorpe, Heathrow, sites. Bookmark the permalink.